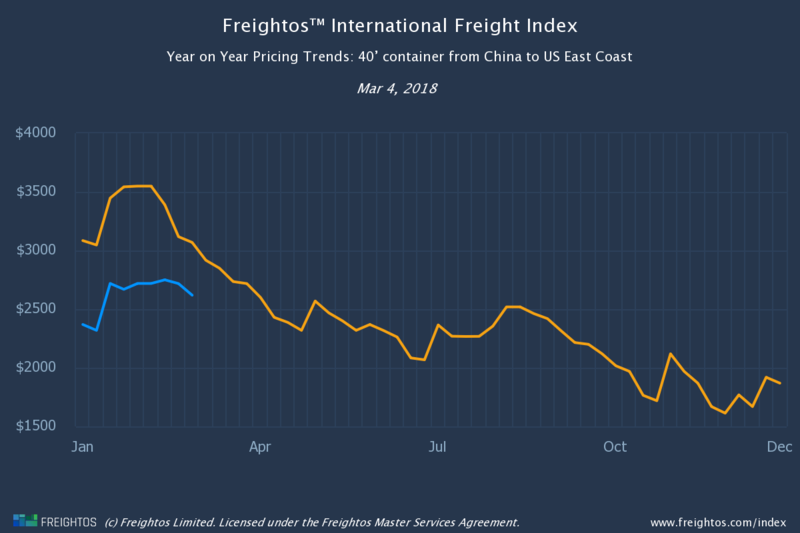 Weekly update article on the Freightos International Freight Index exploring rate trends and their driving forces. Factory production and port activity have now returned to normal in China following the New Year (CNY) shutdown. With air freight being a buoyant market, prices barely moved last week even though off-peak had begun. China-US rates went up a few cents to $3.10-$5.00/kg. Europe-US also went up a few cents to $1.65-2.50/kg. Meanwhile, China-US rates dropped a few cents to $3.05-$5.00/kg. It was a different story on the sea. With essentially nothing left to keep peak pricing going, China-US and China-Europe ocean freight rates dropped last week. Unsurprisingly, March 1 GRIs were canceled. China-US ocean freight rates have been tracking well below the previous year’s rates since early October. That’s made for an average weekly lag so far this year of 24% for China-US West Coast and 19% for China-US East Coast. This week last year was already a full six months after the Hanjin collapse. It was also when, in line with seasonality, prices began falling away. China-US West Coast plummeted 37% in eight weeks. China-US East Coast fell almost as alarmingly, by 33% in twelve weeks. So will prices fall as dramatically this year? That depends on how long Hanjin influenced prices. If it was still influencing prices up to CNY, then prices should fall less dramatically in the upcoming weeks than they did last year. If, however, Hanjin was a spent force, then ocean carriers may be facing steep price falls for the next two to three months. FIGURE 2: CHINA-US EAST COAST RATES PLUMMETED AFTER LAST YEAR’S CNY. THAT MAY HAVE BEEN IN PART BECAUSE OF THE HANJIN COLLAPSE.